OnePlus' OxygenOS Open Betas give us an illuminating glimpse into the company's future software plans. Although it's possible that not every feature that makes it into the Open Betas will be deemed fit for stable release, they give us an advance look at the company's intentions, if nothing else. Today OnePlus has released a new pair of Open Betas for the OnePlus 5 and 5T, and the changes are quite substantial, including "Supported [sic] for Project Treble." Note: as this build supports project treble If you are not running open beta 12 for OnePlus 5 and open beta 10 OnePlus 5T make sure you flash this builds before updating, if not you should clear all data and cache from recovery before flashing the latest build. At the time of writing, the update doesn't appear to be available for us on our varied OnePlus 5Ts via means such as Oxygen Updater. That isn't too surprising, as it sometimes takes a bit of time for these builds to start to trickle out. OnePlus occasionally announces them before they hit test markets. Unfortunately, it also means we can't flash it just yet for our own hands-on—something we're excited to do, given the substantial changes present. There are a lot of UI-based improvements and tweaks stated, such as the redesign for OnePlus' weather app and a new UI for the system app (though we're not sure how that might manifest yet). And although visual changes like that are always entertaining, it's the addition of Project Treble that has us the most excited—if our tense-changing translation of the changelog's slightly broken English is correct. If the addition of Treble support is accurate, it could mean even better ROM support—not that OnePlus' hardware needs any more help there, its products are already among the most popular devices in the root and ROM community. If and when we get a chance to examine the visual changes present in this latest pair of Open Betas in more detail, we'll update this article with some comparisons. Until then, stable-channel OP5 and 5T users can dream sweet Treble dreams. OnePlus jumped the gun a bit on this announcement, as the update itself didn't actually end up rolling out until late last night. If you don't see it on your device and a VPN to one of OnePlus' test markets doesn't trigger the update, it does appear to be live in Oxygen Updater. Unfortunately Jordan—who usually handles our Beta update coverage—is out, but one of our readers (we ❤ you) has supplied us with a small pile of screenshots. Thanks again, "Miku is Best Vocaloid." 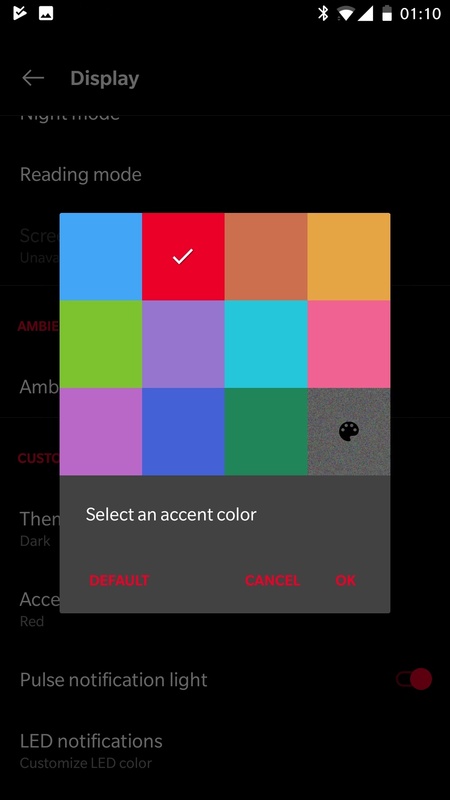 Quick settings toggles (left) and accent color picker in settings (right) on the latest beta. Quick settings icons have been tweaked, in a way somewhat reminiscent of the recent hollowed-out Android P iconography. Accent color finally has a custom picker as well, which has been a long-standing request in Oxygen OS. Those of us (like me) that have been excitedly waiting to get monochrome accents may now have the option. 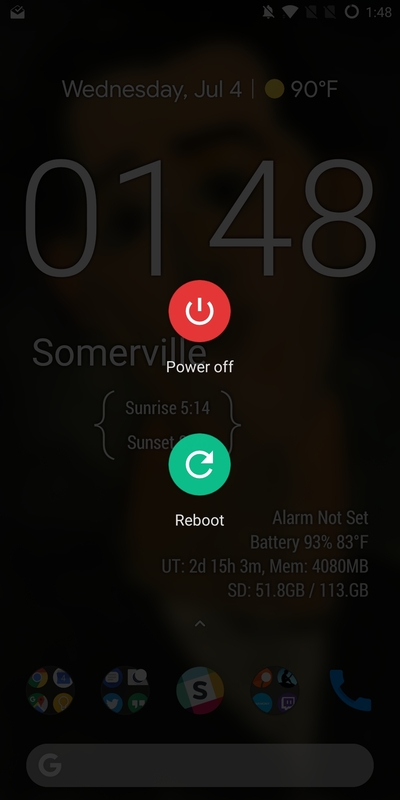 The Reboot menu also has a new monochrome look, with what appears to be a directional swipe for power off/reboot options. 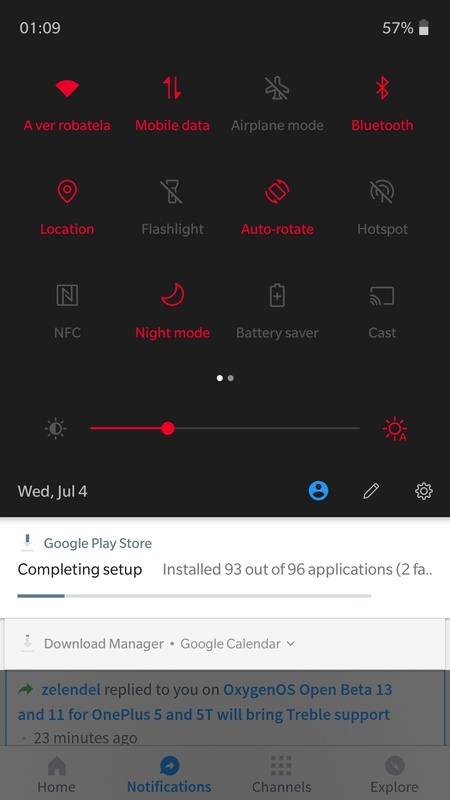 Settings app in the latest Betas (pardon the length). Icon changes carry over into the settings app as well, with the same Android P-ish outlines replacing previously solid designs. So far, it looks like OnePlus was somewhat accurate in describing these changes as "a brand new user interface," as things do appear to have been tweaked across the board. Even so, it's still recognizable as OnePlus software/Oxygen OS. The company has developed a pretty consistent design. 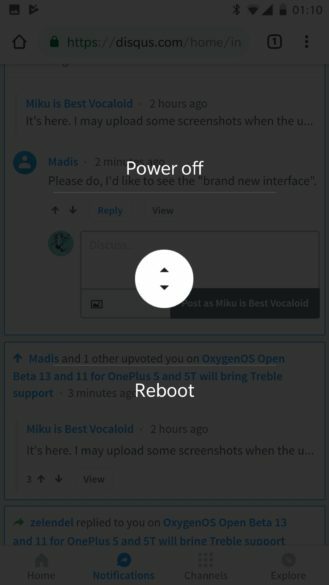 Now we just have to wait and see if/when these changes make it to a Stable Oxygen OS release. We were informed by one of our readers that the OnePlus 5 and 5T did, in fact, have unused partitions that this Treble implementation may be able repurpose, answering the question of how OnePlus added support without repartitioning. The article has been updated with this information. 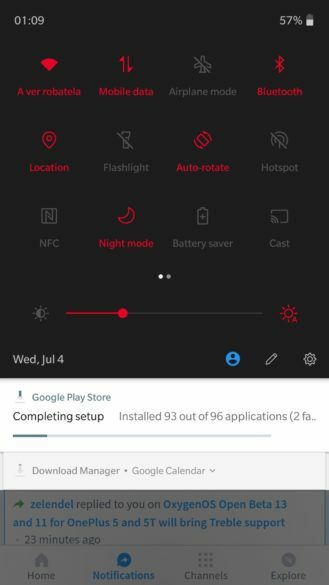 If you are living in the Open Betas, or want to give Treble a try for ROM development, downloads for both the OnePlus 5 and Oneplus 5T have also been posted. 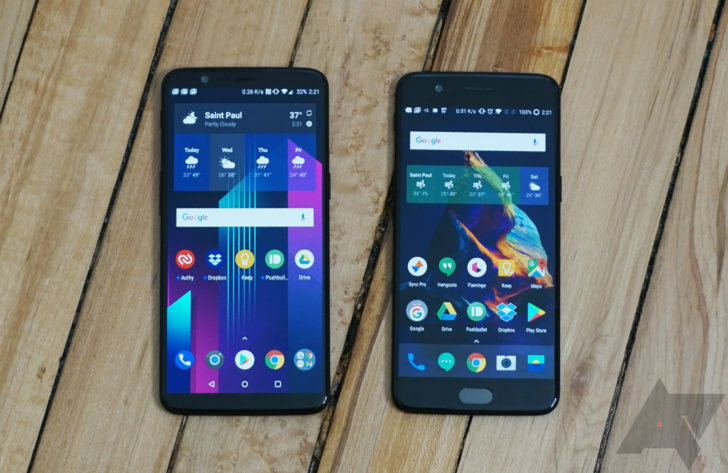 Should you decide to manually flash either of these builds, please remember the warning posted earlier in this article: The upgrade path requires that you first flash Open Beta 12 (OnePlus 5T) or 10 (OnePlus 5) if you plan on keeping your data. Otherwise, you'll need to perform a clean flash/wipe.